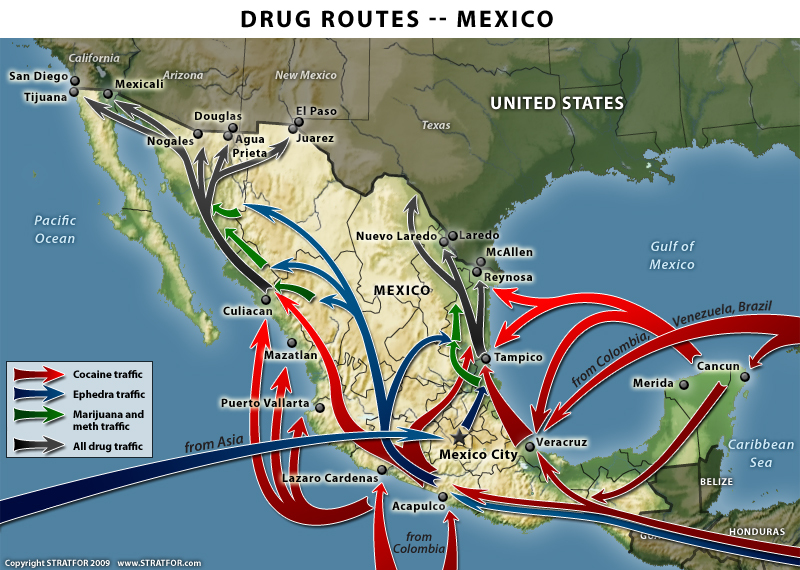 Tags: Mexican Drug Routes, Mexico, Mexico Series. Bookmark the permalink. Interesting. While it’s probably an obvious observation, the areas where ephedra comes in and meth goes out must have a high density of meth labs. STRATFOR published an analysis last Wednesday noting that a reliable source in Mexico informed us that the Sept. 30 shooting death of U.S. citizen David Hartley on Falcon Lake — which straddles the U.S.-Mexico border — was a mistake committed by a low-level member of the Los Zetas drug trafficking organization. The source also informed us that those responsible for Hartley’s death are believed to have disposed of his body and that the Zeta hierarchy was conducting a damage-control operation to punish those responsible for the death and to distance the cartel from the murder. The source further reported that the murder of the lead Tamaulipas state investigator on the case, Rolando Armando Flores Villegas — whose head was delivered in a suitcase to the Mexican military’s Eight Zone headquarters in Reynosa on Oct. 12 — was a specific message from Los Zetas to Mexican authorities to back off from the investigation. Since publishing the report, we have been deluged by interview requests regarding the case. Numerous media outlets have interviewed Fred Burton and myself regarding the Falcon Lake case. During the course of talking with reporters and customers, it became obvious to us that a solid understanding of the context within which Hartley’s killing occurred was lacking in media discussions of the case. Viewing the murder as part of the bigger picture of what is occurring in Mexico makes it far easier to understand not only why David Hartley was killed, but why his body will likely never be found — and why his killers probably will not be held accountable for their actions, at least in the context of the judicial system. In STRATFOR’s annual Mexican cartel report published in December 2009, we noted the growing fracture between the Gulf cartel and its former enforcement arm, Los Zetas, which had become an independent drug trafficking organization. We noted that Los Zetas were becoming increasingly aggressive and that the Gulf cartel was struggling to fend off these advances. In fact, it looked as if Los Zetas were about to swallow up the Gulf cartel. What had been a tense standoff between the two cartels erupted into open warfare in January when Zeta leader Sergio “El Concord 3” Mendoza Pena died in an altercation between Mendoza and a group of men reporting to Gulf cartel No. 2 leader Eduardo “El Coss” Costilla Sanchez. After learning of Mendoza’s death, Los Zetas No. 2 Miguel “Z-40” Trevino Morales gave Costilla an ultimatum to hand over those responsible for Mendoza’s death by Jan. 25. When the deadline passed without his demand being met, Trevino ordered the kidnapping of 16 known Gulf cartel members in the Ciudad Miguel Aleman area as retaliation. The war was on. Fearing the might of Los Zetas, the Gulf cartel reached out to their longtime enemies, the Sinaloa federation, and asked for their assistance in dealing with Los Zetas. The leader of the Sinaloa federation, Joaquin “El Chapo” Guzman Loera, has no love for Los Zetas, who as the former military arm of the Gulf cartel engaged in many brutal battles with Guzman’s forces. Together with another enemy of Los Zetas, La Familia Michoacana (LFM), Guzman joined forces with the Gulf cartel to form an organization known as the New Federation. The stated goals of the New Federation were to destroy Los Zetas, along with the remnants of the Vicente Carrillo Fuentes (VCF) organization, aka the Juarez cartel. A move by the New Federation to destroy the remnants of the Arellano Felix Organization (aka the Tijuana cartel), now very weak, would allow the organization to dominate Mexican drug smuggling routes into the United States. If this New Federation consolidation were to occur (it has not happened yet), it would also likely result in a dramatic decrease in violence in the long term. But the VCF and Los Zetas have not yet been vanquished. This means that while the New Federation clearly has been able to gain the upper hand over the past several months, both Los Zetas and the VCF continue a desperate fight for survival and turf that in the short term means the level of violence will remain high. The emergence of the New Federation was accompanied by the collapse of the Beltran Leyva Organization, a group formerly allied with the Sinaloa federation that broke away from Sinaloa and allied with Los Zetas and the VCF to fight against El Chapo and his allies. As these two developments played out over the first quarter of 2010, we found them to be so significant that we felt compelled to publish an update to STRATFOR’s annual cartel report in May to document the changes. Since January, the Zetas have suffered significant organizational and territorial losses. By May 2010, Los Zetas reportedly had lost control of the strategic (and very lucrative) border crossing of Reynosa, Tamaulipas state, to the New Federation and had been forced to retreat north toward Nuevo Laredo and west toward the transportation hub of Monterrey, the capital of Nuevo Leon state and Mexico’s third-largest city. Jan. 18: Sergio “El Concord 3” Mendoza Pena killed by Gulf cartel, leading to rupture in Gulf/Zeta relationship. March 16: Jose “El Cuervo” Antonio Estrada Sanchez, Zeta leader of the Tabasco plaza, or port of entry for contraband, arrested. March 29: Erick “El Motokles” Alejandro Martinez Lopez, Zeta leader in Quintana Roo state, arrested. March 30: Roberto “El Beto” Rivero Arana, nephew of Zeta leader Heriberto “El Lazca” Lazcano Lazcano and reportedly in line to be the new Tabasco plaza leader, arrested in Tabasco. April: Twenty-five law enforcement officials in Nuevo Leon killed by the New Federation for allegedly cooperating with Los Zetas. May 12: Los Zetas ranch/training facility near Higueras, Nuevo Leon state, seized along with huge weapons cache. May 30: Hipolito Bonilla Cespedes, Lazcano’s accountant, arrested in Monterrey. June 9: Hector “El Tori” Raul Luna Luna, Monterrey Zeta leader, arrested. June 24: Manuel Antele Velasco, Puebla state Zeta leader, arrested. July 7: Esteban “El Chachis” Luna Luna, Monterrey Zeta leader, arrested. Aug. 14: “El Sonrics,” Monterrey Zeta leader, killed by military. Aug. 24: Discovery of 72 dead migrants killed by Los Zetas near San Fernando, Tamaulipas. Aug. 29: Juan “El Billy” Francisco Zapata Gallego, Zeta leader in Monterrey, arrested. Sept. 3: Twenty-seven Los Zetas die in firefight with military in Ciudad Mier, Tamaulipas. Sept. 26: Jose Angel “El Pelon” Fernandez de Lara Diaz, Zeta leader in Quintana Roo state hand-picked by Lazcano in June, arrested. Sept. 30: Gunmen linked to Los Zetas shoot and kill American David Hartley. Oct. 6: Jose Raymundo Lopez Arellano, local Zeta leader in San Nicolas de las Garza, Nuevo Leon (Monterrey metro area), arrested. Oct. 9: Seiky “Comandante Sierra” Ogata Gonzalez, Zeta leader in Tabasco, arrested. All of these recent losses by Los Zetas must be considered part of a longer timeline. As early as 2007, STRATFOR began to discuss the toll that the cartel wars were taking on the enforcement arms of the various cartel groups, such as Los Zetas. The life of a cartel enforcer is often quite brutal and short: Enforcers constantly are in danger of being killed or arrested. In 2007, we noted how Los Zetas were looking to bring in fresh muscle to bolster their ranks, to include other former members of the Mexican military and police, former Guatemalan special operations forces (known as Kaibiles), and even members of street gangs like Mara Salvatrucha, aka MS-13. These young street gang recruits frequently are referred to as “Zetitas” or little Zetas. Such replacements come with a price, however. The original Los Zetas were defectors from Mexico’s Special Forces Airmobile Group (known by the Spanish acronym GAFE), and as such were very well-trained and well-disciplined. As evidenced from the paramilitary training camps uncovered in Mexico and Guatemala, and the fact that Los Zetas reportedly have hired military instructors from a variety of countries (including Americans, Israelis, and some Europeans), the organization has attempted to train their new recruits. But the new generations of Zetas and Zetitas are simply not as well-trained or well-disciplined as the original Zetas. This basic level of training for new recruits has also suffered in recent months as the group has been under tremendous pressure to replace members who have been killed while some of its training facilities have been seized by the authorities. This means the organization has been compelled to use enforcers with very little training who are far less tactically adept than their Zeta masters. They are little more than thugs with guns. And this brings us back to the Hartley case. Intelligence reports we received indicate that a group of poorly trained Zeta enforcers working to keep the Falcon Lake smuggling corridor safe from encroachment by the Gulf cartel and their New Federation partners killed David Hartley. When viewed within the analytical framework of what has happened to the Zetas over the past year, the intelligence fit. It makes sense to us that the Zetas would be employing poorly trained individuals for such duties, that those performing those duties would be jumpy and that these gunmen likely did kill Hartley without orders from the Zeta hierarchy. Although some media outlets have portrayed the murder of an American citizen by a Mexican cartel organization as an unusual event, it is really quite common. In fact, 79 American citizens officially were reported murdered in Mexico in 2009, according to U.S. State Department figures, and the State Department notes that there were probably other cases that went unreported. For 2010, the State Department reports 48 American citizens have been murdered in Mexico through June 10. Our research has uncovered at least another six reported deaths since June 10 (including David Hartley), so unofficially the number of American citizens reported murdered in Mexico is approximately 54 for the year to date. While many of the Americans murdered in Mexico are undoubtedly involved in some way with the drug trade, others have no apparent link. Two of the American citizens murdered in Mexico in 2010 were Lesley Enriquez, an employee of the U.S. consulate in Juarez, and her husband, Arthur Redelfs, a detention officer at the El Paso County Jail. Still, with more than 9,100 murders from cartel violence to date this year in Mexico, the 54 American murder victims comprise only a small percentage of the overall body count. Because of this, some of our contacts in the Mexican government are having a hard time understanding why the Hartley murder has elicited such an intense media reaction in the United States, which in turn resulted in diplomatic pressure on Mexican authorities from the U.S. government. At the same time Mexico is being pressured by the U.S. government about the death of one American citizen, it is also are trying to come to grips with the fact that the lead Mexican investigator in the case was kidnapped and beheaded. This turn of events provides a fairly good illustration of the security environment in Mexico today. It must also be recognized that any attempt to quantify the death toll in the Mexican cartel wars is quickly complicated by the fact that the cartels have gotten very good at disposing of bodies. Many victims simply disappear, and their murders are never confirmed. For example, in December 2008, American anti-kidnapping consultant Felix Batista disappeared from a meeting at a restaurant in Saltillo, Coahuila state. Batista reportedly was murdered, but no trace of his body was ever found. In addition to dumping bodies in mass graves, using wood chippers or feeding them to vultures, Mexican cartels also have developed innovative ways to dispose of their victims’ corpses. Santiago “El Pozolero” Meza Lopez, a Tijuana cartel enforcer arrested in January 2009, admitted to Mexican authorities that he was responsible for dissolving at least 300 bodies in sodium hydroxide, a process known as making “guiso,” Spanish for “stew.” The cartels can either dispose of a body or mutilate it and leave it to be found, depending on the specific message they wish to send. Given the well-honed ability of the cartels to dispose of bodies and the fact that Los Zetas reportedly went into damage-control mode following David Hartley’s shooting, it was not at all surprising to receive a report indicating that that the gunmen who killed Hartley reportedly disposed of the body to destroy any potential evidence. We also received reports that Los Zetas No. 2 man, Miguel “Z-40” Trevino Morales, was angry about the murder of Hartley by poorly disciplined Zeta gunmen acting without permission, and is very unhappy with the attention the case has focused on his organization and their smuggling route through Falcon Lake. While under heavy pressure from the New Federation and the Mexican government, which Los Zetas claim is helping the New Federation against them, the last thing Los Zetas needed was heavy pressure from the U.S. government. This might result in police operations to capture Zeta members and interference with the group’s smuggling activities. In addition to the loss of personnel on the battlefield, Los Zetas also have lost control of valuable smuggling corridors like Reynosa. This means that any remaining corridors they control are even more important to the group and its ability to make money, which is needed to buy guns and hire and train new gunmen to protect the group against outside pressure by the New Federation and the Mexican government. Intensive law enforcement operations looking for Hartley’s body effectively shut down the Falcon Lake corridor. Due to the losses suffered by the organization from this chain of events, it is not surprising that we have received reports that Trevino wants to execute the gunmen who killed Hartley. This means that the shooters in all likelihood never will be found by authorities, much less arrested or brought before a court of law. As organizations such as the VCF and Los Zetas become increasingly desperate in the face of attacks against them by their New Federation enemies and the Mexican government, they will likely become even more paranoid — and more dangerous to those not directly involved in the Mexican cartel wars. As this occurs, there will almost certainly be more cases of innocents caught in the wrong place at the wrong time. It was a brutal massacre even by the gruesome standards of Mexico’s drug war: 72 migrant workers gunned down by the “Zetas” – arguably the country’s most violent cartel – and left rotting in a pile outside a ranch in Tamaulipas state near the US border in late August. Some of the cartel’s initial members were elite Mexican troops, trained in the early 1990s by America’s 7th Special Forces Group or “snake eaters” at Ft. Bragg, North Carolina, a former US special operations commander has told Al Jazeera. “I had some visibility on what was happening, because this [issue] was related to things I was doing in the Pentagon in the 1990s,” Deare, who also served as country director in the office of the US Secretary of Defence, says. “Other cartels have accused them of not following the ‘gentlemen’s code’ of drug trafficking and causing undue violence,” Bricker told Al Jazeera. “At one time, it was considered bad form to kill pregnant women, but not any more.” For safety concerns, Bricker didn’t want to say where she lives in Mexico. Deare estimates “probably more than 500” GAFE personnel received special forces training. He is unsure exactly how long the programme lasted. The Zetas came to the attention of Mexico’s Attorney General’s office in 1999. “They split from the Gulf cartel and formed as a cartel in their own right,” Carlsen, based in Mexico City, told Al Jazeera. The Zetas’ alleged current leaders, Heriberto Lazcano, known as Z-3 and Miguel Trevino, or Z-40, were first recruited by Osiel Cardenas, the now-jailed leader of the Gulf cartel. The name “Zetas” originates from the radio code “Z” used by top military commanders in Mexico. But unlike Zorro, the Mexican outlaw hero who also used the “Z” alias, Los Zetas steal from everyone, not just the rich. And they certainly don’t give much back to the poor, except the corpses of their relatives. “They are just known for being a different kind of human being,” says Bricker. The number of initial defectors from GAFE is thought to be somewhere between 30 and 200, but “the exact number is unclear”, says Deare. However, the possibility of defections should not have come as a surprise to US trainers. “The US really needs to examine their vetting procedures and manuals to see why so many people who they train do so many terrible things when they go back home,” Bricker said. “It wasn’t just US training. The GAFE were also trained by the Kaibiles of Guatemala, a notoriously brutal special operations force from that country’s dirty war in the 1980s,” said Bricker. In May 2006, “La Barbie” a leader of the rival Sinaloa cartel, took out a full page advert in a Mexico City daily newspaper, to allege that Mexican police were protecting the Zetas. Despite debacles surrounding the Zetas and increasing violence, Deare – who physically resembles the tough but fair minded under-secretary of defence played by Harrison Ford in the fictional drug war thriller Patriot Games – thinks Mexico needs more, not less, US involvement. Other analysts are critical of the initiative because it allows the US to “meddle” in Mexico’s affairs and has not garnered the desired results. “For citizens here, Merida causes two great concerns: it raises questions of national sovereignty and there is a lot of fear that under the cover of the drug war there will be increasing attacks on grassroots movements,” says Carlsen. The Zapatistas called NAFTA a “death sentence”, in part, because the agreement would allow subsidised US crops to enter the Mexican market, pushing small farmers off the land. And, if winning the war on drugs is the goal, training the most violent cartel probably isn’t a great start.